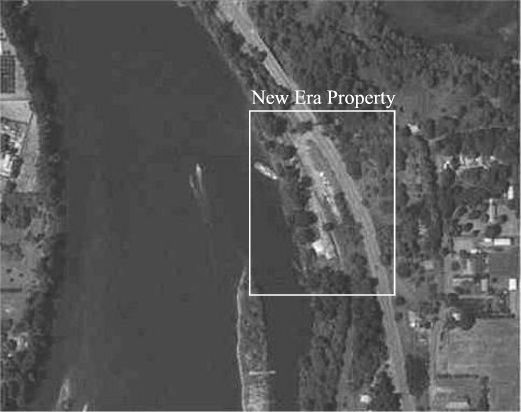 The photograph above is a satellite image of the property at New Era. A large, streamlined ocean-going barge is docked with its bow docked on the property. The submarine bay, complete with living quarters fit for a small village, was buried along the waterfront from directly underneath the south edge of the mobile home (visible just north of this barge); East to within 10 feet of the railroad tracks, and south to the large building that housed the former cedar shingle mill. The submarine bay was made from the substantial reconstruction of two heavy-gauged steel ocean-going barges laid side by side in the former New Era cedar mill pond, and buried. The concept of hiding a submarine inside of a large barge is apparently from a historical perspective not a particularly original solution. The long-range planning and the requisite resources necessary to accomplish the multitude of interdependent tasks required in an operation of this magnitude is indicative of involvement by one or more governments. They not only managed to find and purchase property ideally suited for their needs, but they also secured ownership of a tug and barge company with established routes from as far away as Vancouver, BC. These routes traveled between Vancouver, B.C., Canada, an international port and a country known to be a funnel into the US for terrorists, and several US international ports. These routes also traveled upstream from the port of Astoria, Oregon at the mouth of the Columbia River; upstream to Pier # 4, the international Port of Portland at and above the confluence of the Columbia and Willamette rivers; and upriver past Portland and the locks at Oregon City. These tugs push barges carrying freight, and they are also employed in river dredging operations on the Willamette River and also on the Columbia River, to and beyond the Hanford nuclear reservation. It was nine months after the submarine arrived, and six months after I left the state before I came to the realization that there were barges buried underneath the ground. However, it was the authorities who, alerted to the presence of the underground barges, came to the inescapable but horrific determination that foreign agents had an underground bomb-proof 'OPS' Center replete with a submarine bay. Their operational base was also conveniently located within 10 feet of an international fiber optic cable trunk line, which was being laid from Vancouver, BC to Mexico. I observed the crew of Northern Pacific Railroad burying this cable adjacent to the railroad tracks, a joint venture between Northern Pacific RR and Sprint. As if the presence of the fiber optic cable begged for a solution of how to tie into the line without detection, they also had the additional benefit of a junction on both sides of the tracks due to a curve in the RR line. They could not have had a more convenient link to the outside world if they had custom ordered it directly from Sprint.